Avocado Ranch Dressing Recipe makes a zesty, creamy salad dressing... a little sour... a little sweet, with fresh avocados and regular ingredients you have at home. It is awesome drizzled on almost all salads and especially on greens and chicken salads. It is a delicious substitute for mustard on hotdogs and other meat sandwiches. You can make this Avocado Ranch Dressing Recipe into a dip for dipping raw vegetables such as carrot strips, celery sticks, radishes, whole cherry tomatoes or broccoli and cauliflower florets. While serving this awesome dressing to your family you are also serving up your family an abundance of healthy vitamins and minerals. (See below). This is a rare recipe that is not one of my old fashioned recipes handed down by family and friends in this collection. However, the avocado fruit has a long history which I will share a little with you below. I developed this recipe after tasting a commercial brand that I fell in love with. Upon reading the label I found a small percentage of fruit listed in the ingredients. Since it was so delicious, I decided I would do a copycat of the recipe adding lots of healthy avocado and enhanced taste. I also eliminated the listed water content of the store-bought brand. My taste testers gave me high fives on this Avocado Ranch Dressing Recipe. I hope you like it, too! Avocados are a healthy choice. 1 cup of sliced fruit contains 234 calories. However, that cup of fruit contains 20% of your daily value of Potassium, 24% of Vitamin C, 20% of Vitamin B-6, 11% of Magnesium, 4% Vitamin A, 4% Iron, 2% Calcium, 2.9% Protein and 39 Dietary Fiber while providing 0% Cholesterol. The Center For Disease Control (CDC) a United States Agency, suggests adding more "healthy fats" to your diet. Avocados are on their list of foods containing "healthy or good fats". They contain Monounsaturated Fats in high concentration. According to historical sources, the avocado is a fruit believed to have originated in central Mexico. Mexico is still the greatest producer of the fruit. They are now grown all over the world including California and Florida in the United States. As per the University of California, Agriculture & Natural Resources, Judge R. B. Ord of Santa Barbara, California introduced the fruit to the United States in 1871 with plants from Mexico. Additional tips are based on my experience with this awesome fruit... a NEW favorite. These fruits are available in some stores year around. Other stores stock them when in season from particular growers across the globe. For instance a grower in California ships in particular months. I now only purchase unripened green avocados at the grocery store because they ripen so fast once I get them home. If you are going to use them the day you purchase them the black, ripened ones are OK. Even then the probability of some of the fruit being too darkened to use is high, (the blackened part must be cut away and discarded). I suggest using them within a couple of after ripening. As they ripen, which takes 2-3 days, they will turn dark brown and then black. The flesh will be softer when gently squeezed. 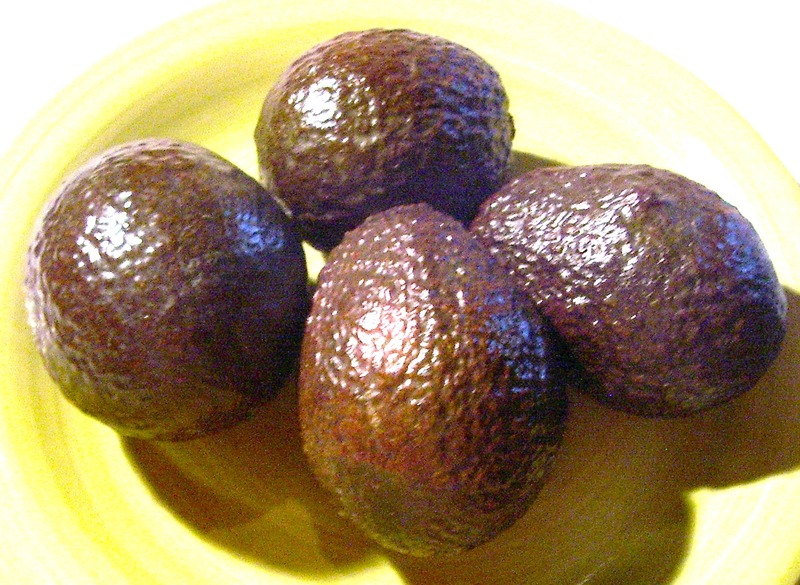 There are many varieties of avocado varieties with slight differences in taste. I prefer the large, bumpy ones that have a slight cucumber taste and the ones that have a slight nutty flavor. They're all delicious! Enjoy this special Avocado Ranch Dressing Recipe! 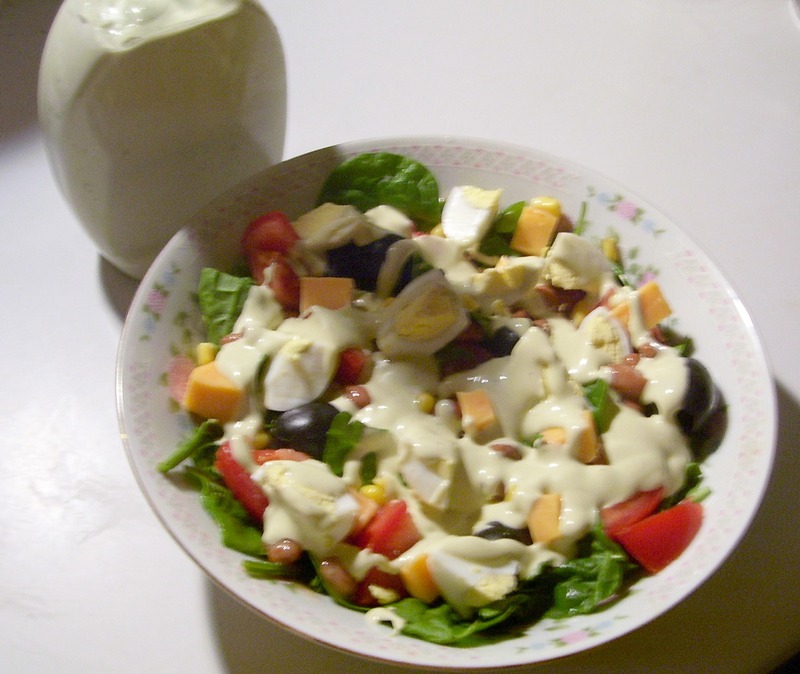 Salad shown above is simple, made with ingredients on hand, made similar to my Cobb Salad. I didn't measure the ingredients just added some of each. This type pares well with Avocado Ranch Dressing Recipe.